I heard many concerns from Evergreen residents and others; valid concerns about the endangered Steel head, environment, safety, drainage and potential flooding issues. These questions are still left unanswered, but construction is still scheduled to start on June 11th. 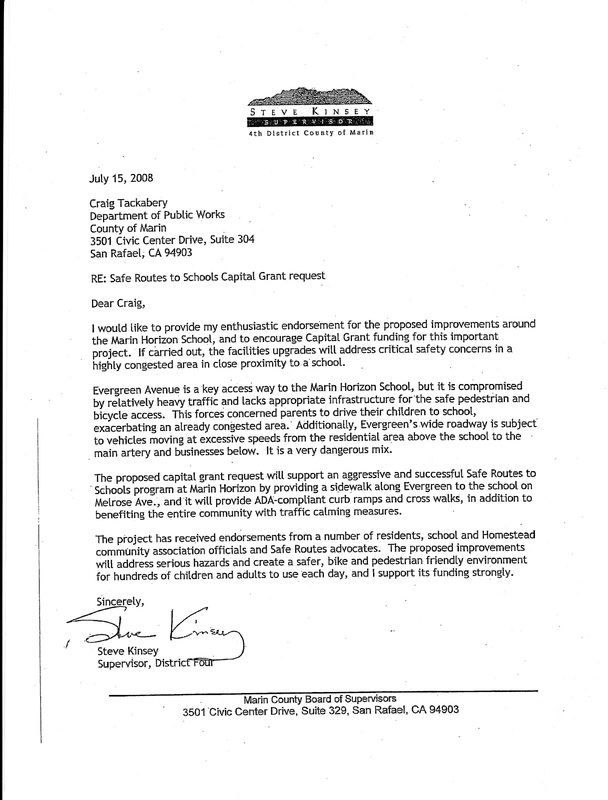 Steve Kinsey, when going over the history of the admittedly FLAWED process, mentioned that other people (HVCA) wrote letters of support for the project in the SR2S grant application, but failed to mention his own letter of support for the project. What was really mind boggling was that Kinsey admitted they screwed up by not getting more community input before creating the design, but they'll "be sure to do better next time." Oh, and they are sure to be advocating for more permeable paths on future projects. Scott Schneider fielded construction questions and comments from folks who don't want this sidewalk. (The wife of one of the DPW staff) didn't appreciate the way I verbalized my displeasure, or what she called "nasty" letters to the DPW and she sure let me know about it. Never mind the fact that I've defended the DPW - We even had to take it outside for a bit, which felt pretty weird, but hey, I've been taking a lot of heat from a very vocal minority who actually do support the project ever since I had the nerve to speak up against this environmentally irresponsible, complete WASTE of Safe Routes funding. I have to say, I appreciate her passion and respect her right to express herself, but I really don't understand how someone can be so concerned about whether or not a comment might "make one of the DPW staff cry..." but not be concerned about how changing the physical characteristics of a street with a perfect safety record might cause someone harm...?? I'm giving her the benefit of the doubt and guessing she just didn't know that much about the history of the project. Why aren't more people concerned that a quite a few property owners - who never asked for a concrete sidewalk and has asked that one NOT be built - are getting stuck with dealing with construction for two months and then the after effects of a concrete slab for eternity? Never mind my neighbors' tears? They don't count? Anyway, there sure are a lot of people who don't live on Evergreen or in Homestead that want to force this sidewalk onto other people - DESPITE the fact that they/we DO NOT want it. As much as I feel empathy for the DPW staff who got stuck with this dreaded Evergreen sidewalk project - I feel more empathy for my neighbors who bought property in a semi-rural neighborhood and are getting stuck with this concrete slab they never asked for and do not want or need. I feel more empathy for everyone who uses the street on a daily basis. I feel more empathy for the children who will learn the lesson that honesty and fairness don't mean much when money is involved. Well, Marin Horizon School teaches "real life" lessons - might as well teach that one early. There is still no evidence that supports the need for this project to go forward - other than, as Mr, Kinsey put it - "so the county can be reimbursed for money already spent." Oh yes, and so the County won't have to pay out of pocket for road maintenance. You see, seems Kinsey WON'T give the DPW funding to just fix our street and/or lower the speed limit, because he needs money to keep County Counsel ready to fend off concerned citizens. In our March meeting, when I mentioned that some people are considering suing to stop the project, he was sure to tell me to "Cost of doing business in the County. We have lawyers on retainer." Kinsey — there appears to be no end to the excrement that tumbles out of his mouth. The grant money is needed so the county can be reimbursed for money already spent? Who authorized County to spend any money without first consulting with those impacted? Fact is, Mr. Kinsey doesn't consult with anybody who stands in his way and runs them over if they do. Overdevelopment and illegal development in Marin have been long-standing concerns and Kinsey has been at the center of much of it. By any definition, this man is a crook. Those interested can learn the ugly details, including Kinsey's history of building without permits, from the wealth of information published by Bolinas's "Coastal Post." Just google "steve kinsey" along with "coastal post" to learn more about Mr. Supervisor Steve "Red Tag" Kinsey. Of all the excuses offered by Steve Kinsey to justify screwing Evergreen Avenue residents, the one that best reveals his appalling cynicism is, "Sidewalks build community." Taken by itself, alone, it amounts to nothing but a cheap slogan. Taken within the context of the rancor among Homestead Valley residents caused by Mr. Kinsey's sidewalk it is seen for what it truly is, a sadistic slap in the face! Professional engineers don't ignore county codes' and ordinances' requirements they modify their work to meet requirements. Why anyone continuingly finds ways to admire county enginneers who are either incompetent or lackeys of Marin Horizon School is beyond comprehension. I agree with your comment re: professional engineers and county codes - but empathy does not equate to admiration. As am family man I can appreciate your passion on an issue that you believe in Mari. However you have taken this issue to a level of cheap shots, and twisted truths, that is now completely unresponsible and wreckless adult behavior. One minute you and DPW are best friends, then next they are the anti-christ. I actually think you feel your actions are legimate. They are NOT- Over the past year I have listened to and read emails that make sit back and just shake my head (and sometimes laugh). I dont know what else to say other than I hope when this is over you take some time to evaluate your behavior and learn how to better respect people and not speak from both sidea of your mouth. by the way, the most twisted of "twisted truths" expressed in this sidewalk saga - is the DPW's survey. 57% of 78% = 49% - NOT a majority. That they choose to count "no response" or "neutral" as supportive is criminal. I worked in good faith with the DPW, and it sometimes it seemed to me that they truly did want to serve the community. However, I realize now that my sincere efforts to inform them of the needs of our community were only twisted to their advantage. DPW’s Scott Schneider is either not informed or a seriously inexperienced engineer. Last night he said Evergreen's soils were impermeable USGS Geological Soils maps show Reed Creeks/Evergreen Ave. valley's alluvium deposit soils to be extremely pervious and not impermeable as he stated last night. In 2005 DPW used permeable asphalt to mitigate MHS new parking lot's oil laden storm water pollution of Reed Creek. Why does what DPW said works for Marin Horizon School's new parking spaces in 2005 now doesn't work on Evergreen Ave. in 2012? DPW's A. Lum and MC Environmental Coordinator R. Warren evaded environmental review required by CEQA by stating Marin Horizon School's new sidewalk project for seriously inexperienced to be "Road Maintenance of existing facilities". They also are either not informed or seriously inexperienced. The County Wide Plan Environmental Policy EQ-1 requires environmental review of Marin Horizon School's sidewalk project for only 20 MHS morning only park and walk students. Why has the county not furnished the environmental review required by county ordinances? Why does Kinsey’s letter supporting Marin Horizon School’s sidewalk for only 20 MHS morning only park and walk students state that heavy traffic makes Evergreen Ave. unsafe for MHS students to walk on? MHS’ 2005 Environmental Initial Study states “ traffic volume on Evergreen Ave. is low” and did not identify traffic on Evergreen Ave. as endangering pedestrians. Seems logical to presume MHS’ county imposed presence in the neighborhood generates the traffic that endangers MHS students. Why not require MHS to furnish a van to van 20 MHS morning only park and walk students ? Why not let a private well heeled school buy a van for +/- $60,000 and save $900,000 in Safe Route To School funfds and at least $100,000 in county matching funds for use by for sidealks and bike routes for public school students. Once again, sir - your ideas make sense. But this project defies all logic. There is more than one person in the DPW department. Some are more sensitive to people and some are more sensitive to budget. My thoughts are my thoughts - and at least I have the GUTS to stand behind them. As for RESPECT - you should have more respect for someone who tells you they do not want a concrete sidewalk forced onto their frontage. If I sent you all the "off the record" comments I have received from people who work in the DPW AND for Safe Routes to Schools - for certain, you would shake your head in disbelief. I hope when this is over - you can grow a spine. My spine is fine and in tact and have no problem at all using it. I also have plenty of 'guts' and used them when I posted my initial email. Cheers. From the safe haven of anonymity "family man" slaps Ms. Tamburo around with heroic self-righteousness, boasts his spine is fine and assures us he has no trouble using it. He adds, "If I sent you all the "off the record" comments I have received from people who work in the DPW AND for Safe Routes to Schools - for certain, you would shake your head in disbelief." OK, Mr. "Family Man," we're all deeply impressed. Let's see that magnificent spine you have no trouble using. Tell us who you are and show us these "off the record comments" you claim to have from DPW. You appear to have a real talent for abusing women. How about men? I have a spine — wanna see it? You show me yours, I'll show you mine! Frank read the email again- nothing mentioned about 'off the record comments' from me- never claimed to have this information. As for me..Richard Stapleton. Glad you chimed in- Not abusing anyone Frank - just speaking how I feel as you do - I've been to all three public meetings, both board meetings, and know about the reviews of the county emails and what transpired. Not taking the county's side, but know people like you, Mari, and Charles have been pretty lame through this whole process- coonstanly attacking this project at any and every angle. So to make it clear has nothing to do with women- just think a lot of the comments are not necessary. Mr. Stapleton = I hope to meet you on person someday. I agree that some of the comments are unnecessary - but sometimes being nice gets you nowhere. People don't pay attention to nice. They mistake kindness for weakness. We didn't ask for this. We DON'T WANT the SLAB. There are other alternatives. I made a horrible mistake. I spent too much time being nice to MHS. I should have been reaching out to the Homestead residents. I don't understand why more people aren't as outraged as Mr. Sands. Call me a dreamer, but I'm putting my faith in the DPW. I hope they put Scott Schneider in charge. We need more people like him in public service. He is HONEST and KIND. And I think his wife is awesome. She was there to support her husband, because he has been through the ringer on this project. Please don't call her names. I can relate to her more than I can relate to people who stay silent while their neighborhood is being ruined. I'm sorry I let everybody down. I can't do this anymore. I never wanted this - I got sucked into it. I'm taking a time out. No more Post for a while. My husband is more important. My house is a mess and so is my yard. Its just as well, because my browser is too old for Blogger and it won't work any more. One more thing, Richard - review of the emails does not show anything but how distressed this community has been by imposition of something they never asked for and do not want. I was trying to do the County and MHS a FAVOR by preventing a big mistake. Everyone is just too busy thinking they know what s best for the people who live here. We are NOT idiots, sir and we are NOT crazy. What is crazy is to STEAL $900,000 from the Safe Routes to Schools fund to FORCE an environmentally irresponsible concrete slab on a street. 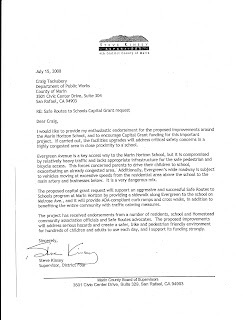 What is crazy is to use children as a FUNDING MECHANISM to subsidize the Marin County budget. This project was hidden from the people who would be most impacted because the DPW probably figured it was no big deal - they do these Safe Routes projects and they are a no brainer - because anything that involves kids is usually non controversial. But what people fail to realize is that we have been trying to tell them for TWO YEARS. I am TRYING TO PRESERVE THE 100% SAFETY RECORD of our street. It's not that I am trying to grab onto a million excuses to stop the slab - I am trying to stop the slab because there are a million reasons NOT to build it! Actually, Frank I'm the one who said - "If I sent you all the "off the record" comments I have received from people who work in the DPW AND for Safe Routes to Schools - for certain, you would shake your head in disbelief." THEY side with the residents! Sometimes hard to follow all this back and forth. Thanks for straightening it out. That said, our so-called "Family Man," the guy with the spine, I don't know how old he is or who raised him, but in my generation, in my neighborhood in Chicago, "family men," and all the rest of the adult males I knew, were men, real men. They talked politics and local issues at the neighborhood barber shop and at the bar across the street, and they aired their disagreements and grievances man to man, eye to eye. They didn't always like each other, but they did respect each other, even if it was grudging. I never heard of any one back then who took cheap shots from cover, like our "family man" here — except for the snipers in Germany and the Pacific. Frank get involved, offer a solution other than the project should go away. Have you ever explored a design alternative, spoke to designer, offered suggestions on materials?? All you can do is put anyone down for agreeing with this project and portray in words how Frank is always right. I'm not sure what role Scott Schneider's wife had at last night's meeting but, it seemed to me it was inappropriate for her to participate in the conversation and to take issue with any of the property owners. One could tell before the meeting that she had an agenda just by the expression on her face. I felt like Hitler had arrived! If the DPW had held the earlier meetings and done the mock ups sooner (as had been promised and the fact that they ignored our repeated requests indicates they wanted to continue with the 'ask forgivness and do what they want' policy they operate under) we would not have had to bring up old issues at last night's meeting. I think Paul(?) (the gentleman with the accent) was right on with his very nicely put comments. Understated, honest and correct! Bravo for him. SO WHO HAS THE WILL TO PARK THEIR CAR ON THE STREET AND NOT MOVE IT STOPPING CONSTRUCTION AND FORCING THE COUNTY TO RECONSIDER ?? I can't spare my car - we need it to earn a living, but you find me 9 people willing to chain themselves up across that street, and I'll make it 10! What I find appalling is the fact that Scott failed to invite Ghilotti Construction to the meeting. I had spoken to the head of the job who knew nothing of the meeting. I read him the letter about the meeting. I called Scott and suggested that he be invited. Scott said he thought it was a good idea. But I sense that the folks on Evergreen prefer to be trod upon in lieu of standing up for their rights. A Chicago community organizer would have his folks roused, angry and up and at 'em... No more MS nice gal Mari ... "Nice guys don't win ball games"
Mari, you wrote: "by the way, the most twisted of "twisted truths" expressed in this sidewalk saga - is the DPW's survey. 57% of 78% = 49% - NOT a majority. " I'll find the chart and scan it for you. No need for a chart. Just count the number of MHS and Evergreen Av. sidewalk pro and con names on the list you deleted. The majority are "out of towner" MHS types. Wonder why this discussio continues? The street trees and plantings will be removed and road saw cutting begins tomorrow. Mari, I wasn't looking for a verbatim restatement. I wanted to know what the numbers, 57% & 78%, represented. Sorry if you've posted it before, I don't hang on every word here. Richard - the DPW fudged the numbers - the Board of Supervisors was led to believe that this project has support. Majority does not support THIS project as proposed. I will show you all the details when we stop the slab - but it does not matter who wants or wants "a sidewalk" at this point. FACT is - we are left no option but to sue to stop this project. County has been put on notice. Suit will be filed on Monday. I'm going to see my neighbors today AND tomorrow to give them moral support. The people who live in that little house have worked hard for many years and they deserve better treatment that to have their plum trees pulled out of the ground - and to have a horrid concrete slab they never asked for FORCED upon their frontage. If we are aware of what is happening and do nothing to at least try to help stop it, we might as well be yanking out those trees and pouring the concrete ourselves. correction - it doesn't matter who wants or doesn't want a "sidewalk" at this point. Just read your filed motion today...No grounds. You think so? The way most of us who LIVE here see it, there are NO grounds to justify building that concrete slab. A path in some places, maybe, but not that horrible slab the whole length of the street. Frank your like a human yoda...you speak in circles and dont make sense. Hardly, It's just that you haven't the intelligence to understand sense.